It has been about a year and a half since I was prescribed,CIPRO FLOXACIN for a urinary tract infection . (2 500 mg.tablets daily for 10 days). On DEC. 2,2010, My right wrist became painful to move up or down, swollen up along with my hand. In a few days my hand was so swollen, I could not close my hand to make a fist. Fingers looked like swollen sausages. Very painful to flex fingers even a little. The tendons to my fingers feel like spring steel, not flexible, will not allow me to make a fist. Now, on March 4th. 2011, My Right hand started to hurt and within 3 days and was swollen, fevery, painful as my left hand. (LEFT HAND HAS less swelling and pain, Still cannot close hand). I have used cold compresses and immobilization which have helped with the pain. I am now noticing a slight tenderness on my left Achilles heel area. GAD,,, WHERE DOES THIS END? I am taking Aspirin only. I'm sorry to hear about your pain. Unfortunately, I can't say for certain whether your symptoms are actually Ciprofloxacin Side Effects or not. It's been a LONG time since you've had Cipro, but you could still follow many of the same instructions that are in my book, the Levaquin Tendonitis Solution that would be likely to significantly help your symptoms. Cipro and posible heart damage? Has any one had heart problems associated with CIPRO? Can CIPRO attack heart muscles as it does tendons? How long does Cipro remain in the body? Can cipro be detected in Blood tests? In answer to your last questions, NO, Cipro cannot be detected on any tests. The DAMAGE to tendons from the Ciprofloxacin Side Effects can be detected on MRI IF the damage is bad enough. If it's minor tears or damage, it won't be detected. Cipro (theoretically) only stays in the body for 3 to 5 days, but it's the DAMAGE and the toxicity RESULTING from it that can last a long time- sometimes a lifetime. It's also a very real possibility that the 'detoxification pathways' that detoxify Quinolone Antibiotics become unable to detoxify for long periods of time and that this contributes to further toxicity because of toxins that build up in the body that you are unable to detoxify. As far as heart problems are concerned, the most common heart problems are Heart Palpitations and Prolonged QT Interval. I took Levaquin in 2005 and had some tendon damage in my R leg. Now whenever I take any antibiotics, my joints all pop. Recently, I had sinus surgery and it has left the radial nerve in my R arm inflamed. I need to know if there is a way to repair tendon damage. MD's are of no help and won't acknowledge antibiotics can cause issues like so many are having. Yes, Levaquin definitely CAN be causing these problems. 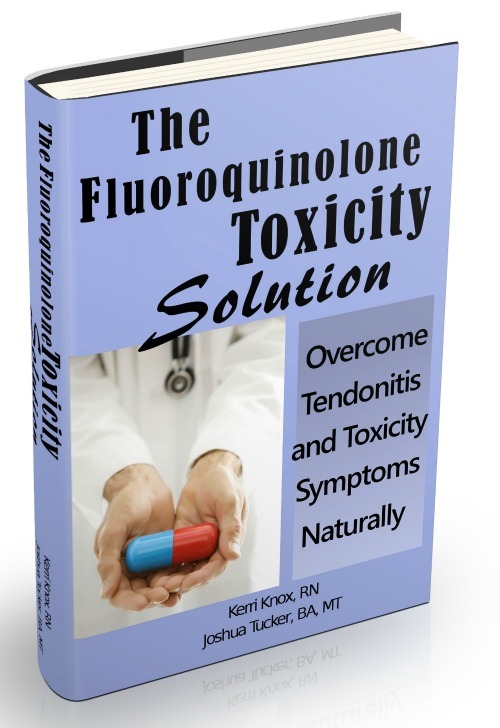 If you are in a situation where you may need to be taking antibiotics on a regular basis and you are having these types of problems, it's IMPERATIVE that you stay away from the Fluoroquinolone and Quinolone class of antibiotics unless it is life threatening. Not 'all' antibiotics cause these problems, and frankly the FQ's are the worst of the bunch from what I've seen. So, seriously, you need to stop taking these- and preferably stop taking ANY antibiotics if it is at all possible. The side effects of antibiotics in general, specifically the destruction of the normal flora in your digestive tract, etc. often can lead to long term serious health problems. Levaquin Tendonitis Solution, as it gives you the best chance of getting over the problems that you are experiencing and start leading a normal life again. Has anyone had the experience of getting RA from Cipro? I have!